Selena and her two cult friends are indeed planning on resurrecting Reign, but outside Sam's body. See, Sam had become too strong and they were planning on separating them anyway, which is why Selena helped Kara in the first place. Also, what we thought was a projection of Selena was actually real-time communication (like we saw Kara doing through the hologram of Alura at the DEO). That would explain why the Selena hologram wasn't constantly around—she was still keeping her cult status under wraps back on Argo City and people might get suspicious if she was always ducking out of meetings with "food poisoning" or something. Our favorite thorn-in-everyone’s-side, Thomas Coville, was fully cooperating with them and was key in the trio successfully re-corporealizing Reign's essence. And for all of his hard work and devotion, he was rewarded with disdain and a big, healthy blast of Selena's heat vision. Welp, that solves the problem of him knowing Kara's identity. Whether or not this fully dissolves the last remnants of the Cult of Rao remains to be seen, particularly with the Dark Kryptonians' appearance. That could reinvigorate them. On the other hand, their eventual defeat may finally have those last few devotees seeing the proverbial light. Something else that may help reform the former Raoists is that Reign was conjured to plunge a mythical sword into the Earth's core to cause an extinction-level event, so the planet can be wiped of all existing life and terraformed for Kryptonians. Rude. I've decided that this is less about terraforming, since Kryptonians can survive on our planet just fine, and more about killing everyone rather quickly and avoiding any long, drawn out rebellion attempts. Even with the Dark Trio having superpowers, it'd take a long time to kill everyone on the planet, not to mention battling any metahumans or other superpowered individuals who might take umbrage with their mission. With three evil Kryptonians and an untethered-from-humanity Reign on the loose, it's all hands on deck. J'onn and M'yrnn stop their almost completed Reach ritual, Alura suits up and travels with Kara and Mon-El through the portal to Earth, and Sam, weakening as Reign grows stronger, voluntarily goes back to the Dark Valley in order to reverse their statuses. Ruby even got to pitch in with some clutch maneuvers, activating Lena's souped up lead shield and providing a distraction so Agent Demos can escape with the blood samples the Dark Trio were after. I think Alura's presence is a pretty big deal. Not only will it be fun to see Erica Durance perform some super feats (harkening to the many instances that Lois Lane gained superpowers) and the rarely seen mother/daughter team up, Kara having another superpowered ally is great. It's one of the things the show really hasn't built up yet and very much needs to. 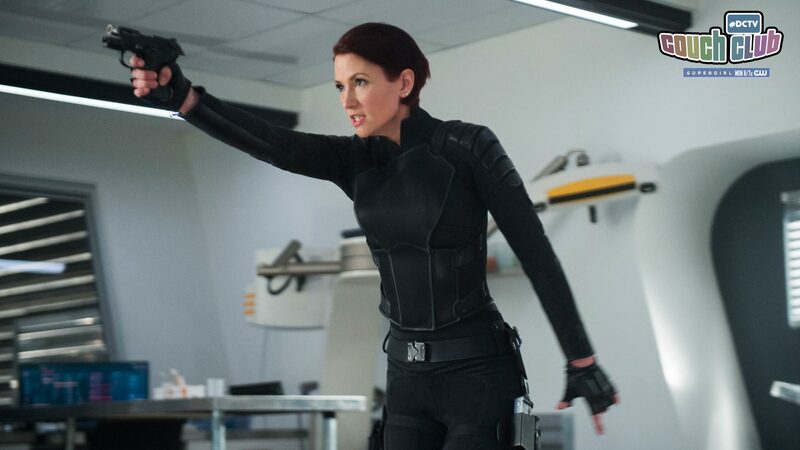 I did enjoy seeing her relationships with Livewire and Psi evolve in "Fort Rozz" earlier this season, but Supergirl could really use some more hero friends that aren't on a parallel Earth for situations just like this. One way this could be accomplished would be for Sam to not only survive, but gain powers as well. I wouldn't expect her to become a full-time hero, particularly with Ruby still being pretty young, but she'd be a good ace to have in the hole. The Reach ceremony was very cool. It was a great way to see more of Green Martian history without long exposition. It also felt like the writers were trying to reassure the viewers just as much as J'onn, softening the blow of losing M'yrnn for us both. But that's going to be hard because I love everything about Carl Lumbly's time on the show and I'm going to miss him terribly. M'yrnn casually offering to shapeshift into the planet to stabilize it is the most underrated part of the episode maybe. How does that even work? Why didn't anyone else pull a double take? And between him passing his memories down to J'onn and probably becoming a part of their new home, he'll forever be with son and newfound extended family. M'yrnn is the greatest. Long live M'yrnn. Alex was looking at that adoption website again. In real life, it can take years to get through the adoption process, so if she starts it now, it may take two more seasons for Alex to finally become a mom. The Black Rock of Utica is actually harmful to the Dark Kryptonians. I'm presuming it's now straight up Black Kryptonite. It would be fitting. Black Kryptonite was introduced in the 2005 SUPERGIRL comic, in the second issue no less, and actually split Kryptonians into two separate entities—one good, one evil (obligatory Superman III reference). That's basically exactly what happened to Sam. It'll be interesting to see what other effects it may have. Winn made a personal shield, which will serve as the cornerstone of the DEO's non-lethal armament initiative. It saved him from a blast of heat vision, but unfortunately didn't save Agent Demos from three. Winn is very depressed about this, and despite James' attempts to comfort him, considers himself a failure. This means Winn will come up with something super genius next week, right? Perhaps in the form of Guardian getting some souped up, tide-turning gear? We don't know how many heroes are active on this Earth, but the worldwide disasters are a great way to address why Superman isn’t popping up in National City to help. But they could also serve as a way to get a couple of those heroes to visit National City next season, as it was the epicenter of this calamity. Nudge nudge, hint hint. What did you think of the episode? Were you surprised by anything that happened? Do you think Sam will survive? Share your thoughts and make sure you join me here next week to discuss the finale!